Irrigation Kit - An ingenious gravity fed system that waters and feeds plants for weeks without the need for pumps, electricity, mains water supply or maintenance! Simply top up the 47 litre tank with water and liquid feed every few weeks. 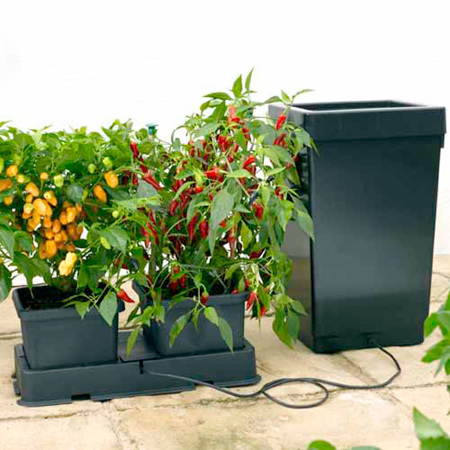 The cleverly designed 'Aquavalve' draws water from the reservoir into the tray section each time the plants have drunk up all that's there, providing excellent results. Ideal for tomatoes, peppers, cucumbers and much more. Kit comprises tank - 'Aquavalve', 2 x 8.5 litre pots, 57.5 x 27cm (22½ x 10½") tray, irrigation pipe and water filter. 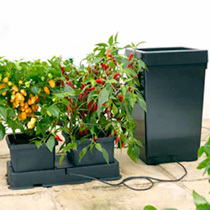 Extension Kit - Add extension kits to feed and water up to 6 pots from one 47 litre tank. Extension kit comprises 'Aquavalve', 2 pots, tray, irrigation pipe and 'T' connector. Buy both - Irrigation Kit & Extension Kit - we will also include a pack of Tomato Gardener's Delight seeds to sow in spring. Waters and feeds your plants for 2 weeks!